"Sent on Tour" is the Blindspot equivalent of a good old fashioned romp. 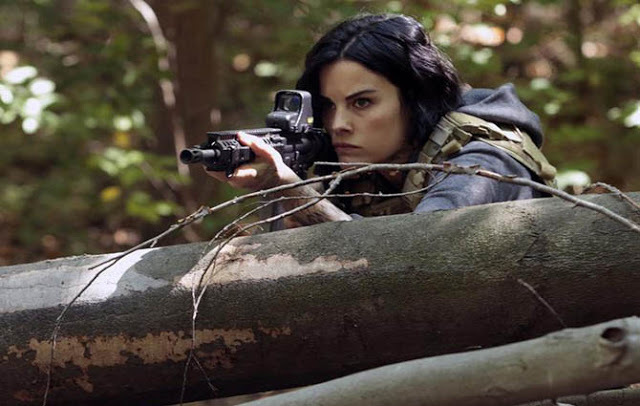 Only instead of hilarious hijinks, Team Blindspot's hijinks involve bullets. But despite the chaos, this week Team Blindspot is in control. We're finally digging into the case file tattooed on Jane's body. You know, the one Mayfair went to a lot of trouble covering up. Kurt finally confronts her and she sings a song and dance about being Sal Guerrero's handler. Guerrero is an informant who betrayed the FBI. They tried to indict him, but he escaped and they haven't been able to find him. Mayfair's hesitance to pursue the tattoo is simply because Guerrero is a source of embarrassment for the higher-ups at the FBI. Uh-huh. I am sure that is the reason for your hesitance. Raise your hand if you aren't buying Mayfair's story, Yeah, me either. What is particularly interesting about "Sent on Tour" is that the tattoos become proactive instead of reactive. Typically in Blindspot, a terrorist event occurs and the tattoo is matched up with the event. It's a bit of a sloppy formula, and often far too convenient. This week, instead of the "case of the week" dictating the tattoos, the tattoos dictate the "case of the week." In other words... SCAVENGER HUNT! The "tattoo within a tattoo" from "Cede Your Soul" leads to a township in Michigan called Drackland. Drackland is suspected of running guns and it is a town that has strong ties to anti-government militia groups. Once Team Blindspot enters Drackland, they stumble upon Guerrero. Arresting the number two criminal on the FBI's Most Wanted list is no easy task, however. Guerrero pays the town to protect him. The team is outgunned and out of communication range in the dense forest. Ultimately, it is Jane's tattoos — the oil rigs and topography with an actual X marks the spot — that leads to their way out. A helicopter. And yes... Jane can fly it. The scavenger hunt forces the team to work together and also to split up. Weller and Zappata lead the militia away. Jane and Reade keep an eye on Guerrero and focus on finding a way out. By splitting into partners, Blindspot is able to examine the dynamics within the team. The dynamic between Jane and Reade has been developing slowly over time. Of course, Reade is reticent about trusting the tattoos, but Jane stands her ground. She knows every inch of the tattoos and she trusts their intent is good — that they are meant to help protect people. The real breakthrough, though, is during the gun battle. Jane draws their fire and Reade covers her. Turns out that when push comes to shove, Reade places his trust not in the tattoos, but in Jane herself. See? Progress! When Guerrero pushes Jane's buttons by insinuating that Kurt is dead, she reacts violently. Reade tells her to take a walk, but also promises not to report the incident. It's one of the first times Reade recognizes how much Jane cares for Kurt. He extends the time honored "code of silence" to Jane in response. He protects his partner from reprimand. It's one of the first times Reade treats Jane as one of the team. Patterson is on her own scavenger hunt, only it's not with Team Blindspot, but with her boyfriend David. He figures out the arch on Jane's tattoo and it leads to a library. David and Patterson discover a book with a cipher. The two geek out over the clues and it is completely adorable. Unfortunately, this scavenger hunt leads to Mayfair tracking Patterson down. She's nearly fired and breaks up with David because he's a "distraction" to her work. Breaking the rules is too much for Patterson. She breaks up with David because she needs rules to feel in control. Love makes her feel chaotic and she can't handle it. The real revelation, however, is Mayfair's relationship to Patterson. If Mayfair truly saw Patterson as a threat, she would have fired her for the breach in protocol. Mayfair protects Patterson and allows her "one mistake." Despite her lies, Mayfair really does seem to care about the team. Kurt refuses to interrogate Guerrero and forces Mayfair to do it, which proves he didn't truly buy her cover story about the tattoo to begin with. But he wanted to see her interact with Guerrero in order to be sure. Ultimately, Kurt determines during the interrogation that Guerrero has no idea who Mayfair is. She was never his handler. And Kurt is the only person on Team Blindspot who can confront Mayfair. His refusal to back down, his commitment to the truth, and his desire to see Jane's case solved are the reasons Mayfair confesses Daylight to him. Weller is like a tsunami wave. When he's coming for you there's absolutely nowhere that you can run. Especially where Jane is concerned. Super ninja Jane is afraid of flying. It is a perfect scenario for Kurt to comfort Jane, but unfortunately, we end up with Zappata doing that instead. Curse you, stupid professional boundaries! Adherence to professional boundaries doesn't stop Weller from sneaking a concerned peek at Jane, however. Yeah... these lines in the sand aren't going to last very long. There's another tsunami wave on Blindspot and it's called Kurt/Jane. Putting on a good professional show, Kurt chooses Zappata to help him lead the militia away. Jane is upset because this means she'll spend the entire time having to worry about Weller's safety. Whereas, if she is with him, she can protect him. Guerrero's needling confirms as much. As does Jane's violent reaction to even the thought of Kurt being dead. In the immortal words of Buffy the Vampire Slayer, "Nobody messes with my boyfriend." Zappata chooses her time alone with Kurt to pour some major truth tea. "You're protecting her. She's more than just an FBI asset to you. It is one thing if you won't admit it. It is something else if you don't even know it." BOOM. It's one thing to not admit your feelings, but it's quite another to be completely ignorant of them. Zappata can see Kurt cares for Jane. It either can be a hindrance to the team or an asset. Zappata needs Kurt to acknowledge his feelings so they can determine which it is. To be a good leader, Kurt must be self-aware. If he's not, and completely ignorant of his feelings towards Jane, then it puts the team in danger. If Kurt can recognize his feelings, even without admitting to them, then at least he's evaluating life and death situations with all the facts. On the return flight, Jane is still afraid of turbulence. Kurt smiles (he smiles! ), grabs her hand (swoon) and asks how she can fly a helicopter and be afraid of turbulence. She believes it has something to do with control. Everything in Jane's world is chaotic, so she searches for things she can control. Flying, hand-to-hand combat, firing a gun, and even deciphering the tattoos give her that necessary sense of control. Kurt gives Jane a sense of control though, too. When she was separated from Kurt, Jane was afraid. She reacted emotionally because she felt a very real sense of chaos. And not only because she wasn't able to help protect Kurt, but because their connection gives her peace. Loneliness is a chaotic feeling. Knowing she has Kurt — that they're in this together — is comforting. It combats the loneliness and Jane feels less chaotic. It's the same with Kurt. He puts on a good show, but the separation from Jane causes him just as much anxiety. It's why Zappata challenged his feelings. The more self-aware Jane and Kurt are about their influence with one another, the stronger they will be. Patterson's abrupt break-up with David is a bit sloppy, but it probably bought him a few more episodes before he's inevitably killed for knowing too much. Guns, water, maps... any cookies? Jane has to strip for the team to decipher a tattoo. That's never not going to be awkward. Reade's reaction to Jane's pilot capabilities was essentially "let's see what else she can do!" It was awesome. Do we really need to explain a book's cipher by using Google docs as an example? Our society isn't THAT advanced. Books are still a thing. Lou Diamond Phillips is fabulous in anything he does. Great write up. You picked up on some subtleties I'd missed and now I have to go back and rewatch the episode. Did you notice Zapata taking a pic while they were inside the oil derrick? Wonder if she was taking it to show her CIA blackmailer. No I missed that! Great catch. I bet you are right. I thought that Zapata was taking a picture of the map that was on the lid of the box so that they would have that if needed. It was the map to the ranger's station. Great review! I have to say that as much as I like Reade, I'm still a bit leery of him. There are slight pauses, looks and reactions from him that, to me, could turn in to a possible twist where he ends up being the bad guy. I just can't shake that feeling that the CIA guy, or someone else, has gotten to him. That we all think it will be Zapata that turns traitor (because of the money that she took), but in the end it will be Reade. And then we will look back on some of these things where they do a flashback and what we thought we saw was really something else. Could be that I have too much of a vivid imagination but I can't help but remember the decoded title from this episode: "Sent on tour" decoded is "Trust No One". I really liked Kurt and Jane in this episode. Not sure I'm ready for a romance, but I do love their connection. Loved that Reade seemed to accept Jane a bit more as a team member. I must be the only one though that isn't a big fan of David. My heart did break for him and Patterson, but his unwillingness to listen to her about not working on the puzzles made me grind my teeth a bit, but then so did Patterson's inability to put her foot down on the matter which ultimately lead to being found out. Why would David stop when Patterson kept saying no but then going ahead and working on the puzzles with him. Don't get me wrong, I love Patterson and I get her tenacity and even love her for it, but this situation was of her doing. I'm wondering though if David is something more than a love interest for Patterson? His determination about the puzzles makes me think he's not there for Patterson at all, but rather the information he can get from her. But that goes back to the decoded title "Trust No One". Mayfair is an enigma. She seems to care, but would that matter if she ultimately has to sacrifice any of them to save her own neck or career? Which only makes her character even more interesting. All in all, a great episode and as with each episode, I ended up with even more questions than I had before the episode. Which just keeps me watching each week!